ADVANCED CANDLE MAKING Workshop by HOBBY in a BOX The process of making candles is equally fun and calming. In the workshop you will make and take 4 different types of candles back home. Also you will learn the nuances of choosing right kind of wax and essential oils for your candle making. 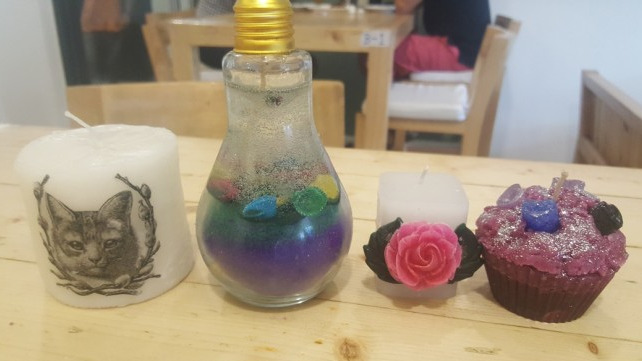 In this workshop you will learn: - Image Transfer on Candle (paraffin wax) - Gel decorative Candle - Embed Candle - Cupcake Candle(textured wax) What will Participants take away: - 4 candles made during workshop. - Food and Beverages worth Rs.300. What to bring – Your creative bent of mind and nothing else …. All the raw materials will be provided at the venue by Hobby in a Box. Share "Advance Candle Making Workshop by Hobby in a Box"